FUT there is a linear long cut is given on the back side of the head to harvest a skin strip. The wound is closed with sutures. After healing there is a long liner cut which is covered by adjacent hair. This scar will show after shaving. FUE Method means follicular unit transplant in which individual hair follicles are harvested without giving any linear cut and no suture is put after surgery. There is a circular punch which is mounted on the motorized handle. The head is completely shaved. After giving local anaesthesia grafts are harvested. The general population does not like a long linear scar and they feel it is a surgery or operation in which head is cut. So more or less it is a fear factor. As far as technical aspect is a concern the FUE done by the untrained surgeon than chances of follicle damage is much more as compared to FUT. But much of work is done by an assistant in FUT so it is very important to have a well-trained assistant for FUT Method. The harvesting of follicles in FUE and strip harvesting in FUT is done by the surgeon and also surgeon makes slits while implantation is done by assistants. In both a good trained qualified surgeon and assistants are mandatory. Chances of scar widening, hypertrophic scar painful scar is there in FUT while chances of these are much less if done properly. If multiple strips to cover large bald area is done than the total time consumed is much longer in FUT because of the time interval between two surgery one year while in FUE only two months. FUE surgeon can take hair follicles from a beard, chest and other body area but by FUT we cannot take hair follicles from another body area. FUT needs no ber assistant, large OT set up and more trained technicians while FUE is mainly surgeon based technique and surgeon extract grafts. 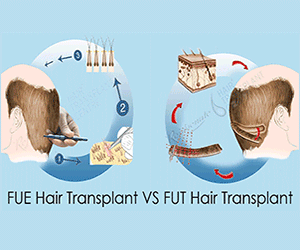 While in FUT assistants do processing of grafts means slivering and follicles dissections. FUT seems to be more invasive procedure while FUE is less. The Final Outcome in Terms of Hair Growth is Same in Both Techniques. It is very important that FUT and FUE both shall be done by well trained and qualified surgeon and a team of technicians in standards operative conditions taking all aseptic precautions.